O-Seed is not available in the US at this time. Please bear with us while we replenish our stocks. We apologize for any inconvenience. Omega-3 fatty acids are essential to human health. In particular, alpha-linolenic acid (ALA) must be available in the diet because the body cannot produce it. The most readily available sources for ALA and other omega-3 fatty acids are ocean fish, such as herring, salmon, halibut and tuna, and oils derived from these sources. But these sources are not an option for vegetarians, who turn to a variety of seeds and nuts, which also contain ALA. Essential fatty acids come in two groups—omega-6 and omega-3. Each is important. However, a normal diet contains far more omega-6 fatty acids than omega-3s, which may lead to an imbalance between the two. The good ratio of omega-6 to omega-3 is approximately 1:3, or higher levels of omega-3 by about two-thirds. Most omega-6s in the diet come from oils used in cooking, which have omega-6 to omega-3 ratios ranging from canola oil at 2:1 to safflower oil at 365:0. 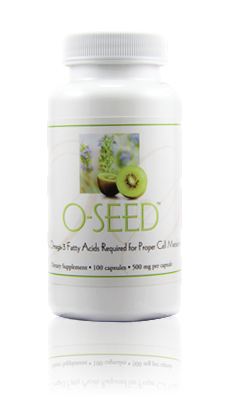 O-Seed contains a combination of chia seed and kiwi fruit seed. These two seeds have two of the highest levels of the omega-3 fatty acid ALA of any plant sources. Chia seed contains 64% ALA, while kiwi fruit seed contains 62% ALA. Together they provide a good source of this omega-3 fatty acid, and help to balance out the omega-6 to omega-3 ratio in your diet. O-Seed™ provide healthful phytochemicals, antioxidants and polysaccharides that are not available in animal products. Antioxidant activity in chia seed includes chlorogenic acid, caffeic acid, flavonol glycosides, kaempferol, quercetin and myricetin. Kiwi fruit seed is very high in vitamin C, polyphenols and tocotrienols, all of which help fight free radical damage. These seeds also help provide some additional fiber in the diet. For tiny little seeds, these two pack a powerful Nutritional Immunology punch that O-Seed brings to you! Made from chia seed and kiwi fruit seeds, O-Seed capsules are a wholesome source of plant-based omega-3 fatty acids to support heart and brain health. O-Seed is suitable for vegetarians and those who do not like the fishy taste of fish oil supplements. Q What is unique about O-Seed? Q Is O-Seed suitable for vegans? Yes. O-Seed is made from wholesome chia seeds and kiwi fruit seeds. However, strict vegans may want to open the capsule and take the contents only because E. EXCEL does use bovine gelatin capsules. Yes. 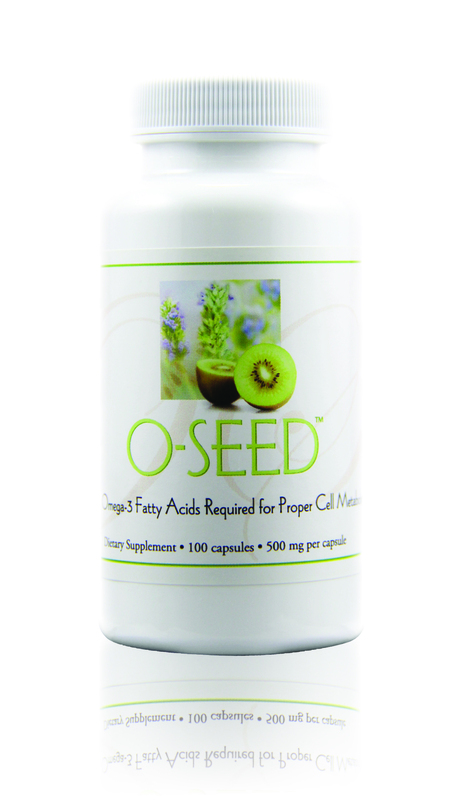 O-Seed is made from chia seeds and kiwi fruit seeds. Produced in GMP-certified manufacturing plants, O-Seed does not contain animal products, by-products or derivatives, starch, preservatives, yeast, wheat, corn or dairy. Q Why does O-Seed use the whole chia seed and kiwi fruit seed instead of extracted oils? Oils have higher calories and less phytonutrients. The whole seeds have more antioxidants and other phytonutrients. Other nutrients in the whole seeds complement omega-3 fatty acids. he human body more easily absorbs omega-3 fatty acids in their wholesome form.